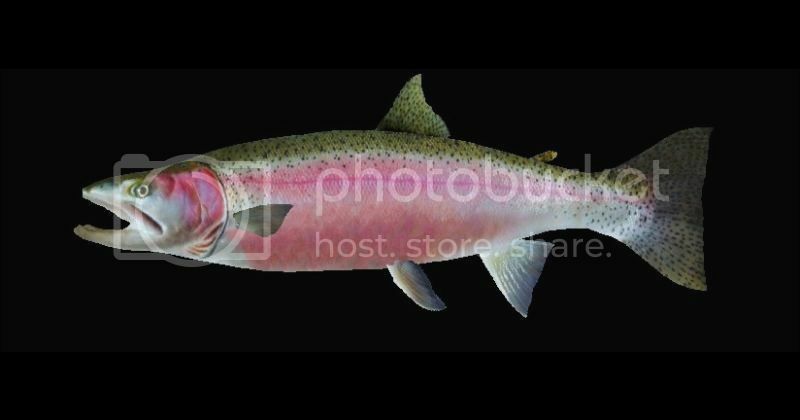 pishtech.com • View topic - New Jumping Red Steelhead For Ya! New Jumping Red Steelhead For Ya! Wow! We certainly have another great Outing Challenge tournament going right now. Guys are achieving unbelievably good scores as usual and the effort has been tremendous. A friendly competition always brings out the competitive instinct in all of us and this is really cool. Thanks guys for participating in our holiday tournament and whoever wins in the end really doesn't matter. In my mind all of you guys are Champions in your own ways. While you folks are wrecking your brains on how to get the highest score and the biggest fish, I want you to know I have not been idle with my time. While fishing the McKenzie River outing containing the Steelhead trout, I wasn't quite satisfied with the way the fish looked in the scenes. So how can I improve it, and bring you guys a even better fishing experience? Well, tonight I sat down and built another version of the beautiful Steelhead trout for our future outings. I will try to get some new caught pictures for this fish but the maximum size of the fish will remain the same as the previous ones. 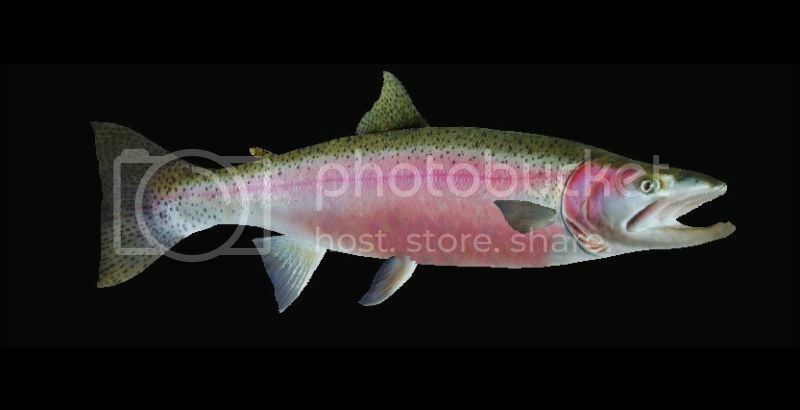 Here you see the new Jumping Red Steelhead Trout. I hope you like it and will enjoy catching it in future RWFF outings. Re: New Jumping Red Steelhead For Ya! There is no telling what is swimming in Stanley's fish pond. A while ago I built two versions of the Coho Salmon for Chuck's Great Lakes outings but never got to finishing them. Chuck was going to build the outings but he was side-tracked and didn't get to finish them. Anyway here are two versions of the Jumping Coho Salmon. A Silver version and a spawning version with the typical red color. I checked my fish folder and they are not in there so they have not been completed and finished yet. I will need to get some good caught pictures for them later. Hope you like these guys. Yes, they will jump! Lovely looking fish, cannot wait to set a hook into one of these big guys. Glad you liked the fish and I hope you will be able to fight them in a new outing soon! Come to think of it, maybe you can build one that has these fish in it?